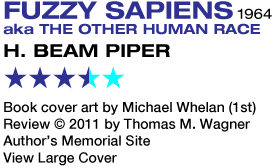 In Fuzzy Sapiens, published the year of H. Beam Piper's death, the question of the Fuzzies' intelligence has been settled, but their fate as a species is still very much open to doubt. The likelihood of their exploitation at the hands of the unscrupulous is a constant worry to Jack Holloway, the old prospector who first discovered them, who now serves as their officially appointed protector on Zarathustra. The Zarathustra Company no longer has its charter granting it exclusive rights to the planet and its resources. This should have made things safer for the Fuzzies. Instead it's Katy-bar-the-door. Some of Holloway's former enemies are now his allies. Most surprisingly, Victor Grego, the company man who went so far as to put a bounty on Fuzzy pelts, has, since his legal defeat, made an alignment switch and adopted a Fuzzy of his own. The little critter, whom he names Diamond, has somehow found its way onto company property and directly into Grego's residence. But while Grego takes to the little Fuzzy quite happily, the situation tips him off to a possible criminal conspiracy to abduct and traffick the creatures. While investigating this fearful possibility (at least five Fuzzies are known to be missing, along with two men Grego once employed), Holloway must also deal with a mushrooming demand for legal Fuzzy adoption. Hundreds of human families want Fuzzy company, and if demand isn't met through legit channels, the worry is that an illegal market may fill the gap. Other worries pop up. Fuzzies already have a low birth rate, but now they seem genetically predisposed to birth defects. What could be causing this? If it isn't one thing, it's another. 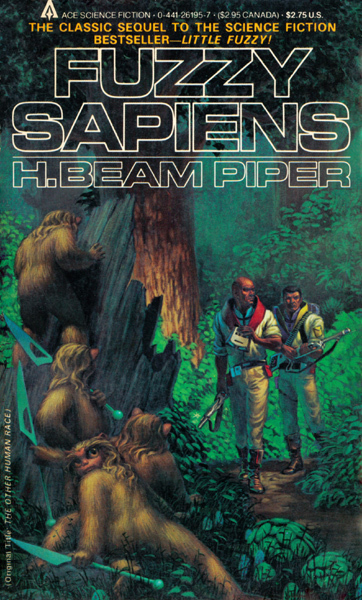 Fuzzy Sapiens is hard SF very much of the old-school, and it tells the kind of solve-the-problem story that quickly became associated with Analog magazine. Plot is everything, and the characters serve the function of solving whatever crises the plot throws at them with their scientific ingenuity, while such trivialities as character development and interpersonal relationships are, if not abandoned altogether, treated as secondary. Hard SF as strict idea fiction appeals to a smaller and smaller reading demographic fifty years on, but I think there is still a place for stories like this, and I enjoy them a great deal when I'm in the mood for one. What is notable all throughout the book is the way Fuzzies are compared to children. As one character observes, "Maybe we'd be like Fuzzies, too, if we didn't have a lot of adults around us from the moment we were born, infecting us with non-sanity." I think for Piper, the Fuzzies represented, probably not something so banal as innocence, but a resistance to moral corruption, which is a higher and more slightly nuanced ideal, you might say. Fuzzies aren't without conflict amongst themselves, but they soon find ways to settle their differences sensibly. I'd suggest that's emphatically not a childish trait. They aren't perfect little angels (and the whole series would have gotten tiresome fast had Piper put the Fuzzies on that kind of pedestal), but they have a naive rationality that manages to transcend humanity's baser, more selfish impulses. And I think that's how Piper wished humans could behave. The thing about Fuzzy Sapiens that may alienate readers inexperienced in reading older SF is that the story is exceedingly talky — in fact, virtually every scene is conveyed in dialogue, with action and more visceral drama barely rearing their bourgeois heads — and it rarely focuses on one core narrative thread to build to a conventional climax. There is a traditional antagonist, a stereotypically slimy attorney who seeks to game the newly unincorporated planet's laws for his own political gain and personal wealth, but he is merely one of many problems on the protagonists' docket. But we get some good tension towards the end, as plot threads are pulled together. So the novel is not the kind of SF adventure that modern readers may be accustomed to. But Piper keeps the wit and charm of the Little Fuzzy intact, and the best scenes are those in which the problems needing a quick solution — the birth defects, the fear that they may be running out of the kind of food Fuzzies have gotten used to and don't know how to synthesize more — provide the kind of intellectual engagement that good SF can make as involving as any other sort of drama. 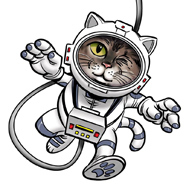 Fuzzies do indeed have a lot to learn, and a book like Fuzzy Sapiens is a reminder that science fiction, at its best, celebrates the joy of learning and discovery science brings. From here, the Fuzzy saga forks. A third novel, Fuzzies and Other People, was thought lost until its manuscript was improbably found 20 years later in an attic trunk. Prior to its publication, Piper's estate authorized two sequels, William Tuning's Fuzzy Bones and Ardath Mayhar's Golden Dream: A Fuzzy Odyssey.